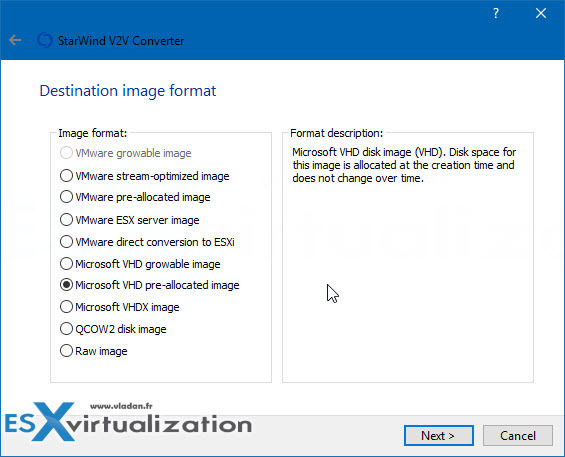 StarWind just updated their popular free utility – V2V Converter. This took is able to convert different king of VM images from one hypervisor format to another. For example from Microsoft to VMware or the other way around. Other hypervisors such as Citrix XenServer or QEMU are also supported. StarWind V2V Converter allows to for example to pick some VHD files on some external USB, or if you downloaded some Microsoft preview software as VHD, and convert it to, let’s say VMDK. If your lab is running on VMware ESXi. StarWind V2V Converter allows the conversion of VMs from one format to another, basically “cloning” them and keeping the original file intact. The latest release of StarWind V2V Converter is V8 build 170. Windows Repair Mode – StarWind V2V Converter makes migration between different hardware sets easier, supporting Windows Repair Mode during conversion to VHDX. This way, the VM automatically adapts to the given hardware environment, negating any compatibility problems. Zero-Copy – StarWind V2V Converter allows easily converting VM formats directly from one hypervisor to another. There is no need to create the copies of the source and destination VM files on a local machine, making the conversion process extra simple. Hypervisor Switch – StarWind V2V Converter supports all industry-standard hypervisors including Microsoft Hyper-V, VMware ESXi, Citrix XenServer, and KVM. By converting VMs from and to any selected format, it allows easily migrating between different hypervisors. Supported formats – StarWind V2V Converter supports all modern formats such as VMDK, VHDX/VHD, RAW IMG, StarWind native IMG files, QCOW2. It works both ways, converting from and to any selected format, thus having better functionality than similar converters. StarWind V2V Converter has been recently updated by StarWind and brings some new features and improvements. Mostly fixes. Let’s have a look what’s in. Fix for the “Internal error (8) ” error: a conversion error occurred when VHDX was a destination format, and the source image size exceeded 2TB. I must admit that I’m not using this tool very often, but it is in my toolbox for conversion which cannot be achieved by other conversion tools such as VMware converter. It’s always good to know that this tool is maintained and further developed. Check it out.